Plastic piling probably isn’t the first product that comes to mind in regards to domestic use, especially when appearance is just as important as strength – but one construction firm has described it as a ‘godsend’ on a recent project. 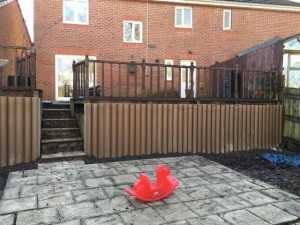 When the owners of a beautiful South Wales home discovered that a timber retaining structure in their garden was in danger of failing, they contacted the original developers for help. Redrow Homes, the company behind the estate in Pontllanfraith, called in a sub-contractor to correct the issue and specified Liniar log piling as the ideal product to replace the existing wooden support. Brandwells Construction was founded in 1973 and has since grown to become one of the most highly-regarded building and groundworks companies in the South West and South Wales. Mike O’Connor, Contracts Manager at Brandwells, takes up the story: “Redrow contracted us to go along and fix the problem. It was quite a mess to be honest, the timber retaining structure was rotten and falling to pieces meaning that the deck and garden above it was in serious danger of collapsing. 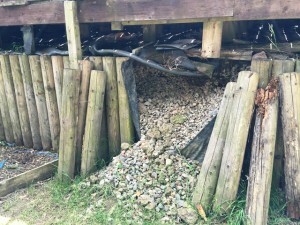 “Liniar log piling had been specified to replace it and it proved an absolute godsend! Once we’d removed all of the rotten wood the piling was nice and easy to install – much quicker than building a brick wall. “We simply dug a trench then sat the piles in concrete and, because they are hollow, it enabled us to fill them with in-situ concrete mix to create an incredibly sturdy structure. “As they’re plastic, they won’t rot like timber, so they will be there for the long term. And the homeowners were delighted with the finished job because they look really nice too. They have a wood polymer composite on the front surface for added aesthetic appeal. Liniar log piling is manufactured in the UK using recycled plastic. Not only doesn’t it rot or rust, its lightweight properties make it easy to handle and transport, it can be easily cut or bored and is maintenance free. Click here for more information about Liniar log piling or call 01332 883900.